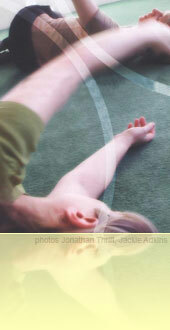 forms the basis of classes and workshops, and is a verbally guided exploration of a sequence of movements. Each sequence will have a focus, of either a particular body part or movement theme. There are a virtually infinite number of such sequences. Most lessons take place laying on the floor, although some are taught in sitting or standing. The experience is rather like solving a riddle - a physical riddle: movements are repeated many times, emphasis is placed on observing ones' sensations, feelings as one moves, on noticing the quality of each movement, with the intention of increasing smoothness, lightness, and effortlessness rather than speed or strength or quantity. Learning to explore the world of internal sensation gently and respectfully creates an environment where long held patterns of tension and pain can dissolve and release. to offer continued improvement - initially in mobility and subsequently in thinking and emotional levels. Course and workshops are designed to provide the most effective somatic learning environment for students, our courses are structured to encourage and support a weekly committment and are priced accordingly. Are focused around a particular topic, and usually comprise a selected series of 'Awareness Through Movement' lessons which are chosen for their compatibility to work together to allow a more in-depth exploration and understanding. Generally we will be working individually, sometimes partner work and 'Functional Integration' may be used.